In today’s competitive landscape, SMEs have an advantage over large enterprises that need to be leveraged now more than ever: speed and agility. Unlike corporates, SMEs operate as small teams that can make — and implement — decisions in hours and days, not weeks and months. However, one of the challenges SMEs continue to face is cash flow. Without the ability to invest in enterprise-level hardware, SMEs have been constrained by access to technology. Go Inside Microsoft Azure 2019 – an exclusive white paper and nine-part video mini Series. Revealed: Nine reasons why South African businesses are migrating to the Azure Cloud. Plus: A practical guide to migrating your business to Azure. As is now clear, public cloud has changed the game. Access to enterprise-level software, using flexible pricing structures that can grow with a business’s needs, means that SMEs can now compete head-on with corporates, while retaining their speed and agility. This is Microsoft’s vision: to provide businesses large and small alike with the same tools and functionality, and Azure is a key tenant of that vision. On Azure, you can scale up and scale down at any time — depending on workloads. Not only does this give SMEs flexibility, but it removes many restraints that are present with on-premise hardware. For an SME, where cash flow is crucial, the time and cost associated with maintaining hardware and physical servers are reduced. In addition, public cloud solutions and hybrid-friendly solutions like Azure increase speed, efficiency, agility and productivity in a business because they are software defined. We like to call it “pay as you grow”; you don’t need to invest in more servers as your capacity and requirements increase. Rather, you can simply invest in more services or unlock more users. You pay for what you need — nothing more. This gives SMEs the freedom to grow without incurring large capex costs. A key growth challenge faced by SMEs is financially overextending — investing in growth that the business cannot maintain because of the investment’s impact on cash flow. In South Africa, more than 80% of business owners have identified seasonal cash flow as the greatest challenge facing the SME sector today, which begs the question: how do you grow without overextending yourself? One of the key ways is through software as a service (SaaS), platform as a service (PaaS) and infrastructure as a service (IaaS) — all offered by Azure. 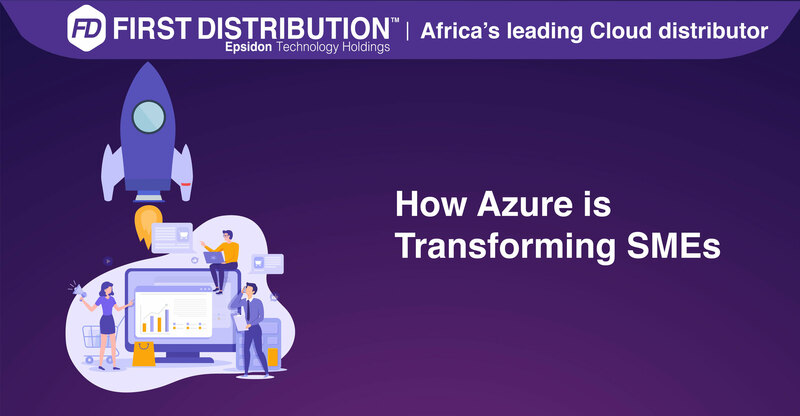 As Africa’s leading cloud distributor, we have seen the impact that having access to speed of deployment, operations and scalability when they need it has had on the growth of SMEs. Why invest in any solution before you need it? And more importantly, why invest in something until you can see the impact it will have on your business? Flexible cloud solutions ensure that you only use — and pay for — what you need, when you need it. Running your business on Azure ensures that your business is always operating, with world-class uptime. The loss of revenue and system downtime can be devastating for SMEs, which is just one more reason to seriously consider what Azure can do for your business. First Distribution is the leading value-added distributor in Africa. Our offering includes a product portfolio of global leading data centre, cloud, networking and security products and services. This embraces hybrid solutions with access to any combination of on premise, private cloud and public cloud end-to-end solutions from multiple vendors. The portfolio, together with highly skilled staff to support and manage vendors with an unrivalled level of expertise, ensures that our partners have the key elements required for success. First Distribution additionally hosts one of the largest technology partner-to-partner networks in Africa allowing partners to extend the reach of their solutions across the continent. Visit www.firstdistribution.com to find out more.